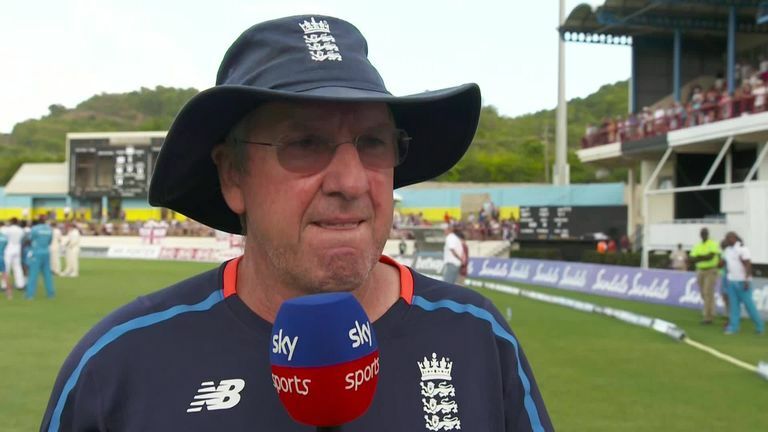 Trevor Bayliss says Jason Roy and James Vince are on England's Test radar with the side still looking for their top three ahead of the Ashes. Surrey batsman Roy is a staple of England's white-ball side but has yet to play a Test, while Vince averages 24.90 from 13 Tests with a top score of 83 in Brisbane during his country's 4-0 defeat in the 2017-18 Ashes series. England head coach Bayliss also refused to completely rule out a return for Ian Bell, 37, who played the last of his 118 Tests in November 2015. "Jason is one of the names that's been spoken about over the last six to nine months as a possibility. He could be a Test player," said Bayliss, after England's 2-1 series loss in the West Indies. "James is another one who 12 months ago played pretty well in Australia in patches. If those two guys come out and score runs they'll be in the mix. "To be honest, [Bell's] name hasn't been mentioned as near as many times as those other guys. But you never say never." Keaton Jennings, Rory Burns and Joe Denly comprised England's top three in the final Test in St Lucia - and Bayliss says they could remain in situ. Denly, playing just his second Test, pressed his Ashes claims with 69 in the second innings, but Jennings made scores of just eight and 23 after his surprise recall leaving his England average at a lowly 25.19 from 17 games. Burns averages exactly 25 from his six Tests - the Surrey captain having scored a fifty apiece in Sri Lanka and the Caribbean this winter. "Those three guys are the incumbents in those positions, I suppose," said Bayliss. "If they come out and score as heavily as they have done in the last few years in county cricket then it might be difficult to look past them. Bayliss says early-season runs for England's current top order will go a long way to nailing down an Ashes berth. "If Keaton comes out and scores a lot of runs in the early matches of the season and no-one else does then there might not be a decision to make. "We're still looking for those places. Supporters of English cricket want to have 11 exceptional cricketers but it's taking time. England trialled Jonny Bairstow at No 3 in the final Test in Sri Lanka and the first two against Windies, with Ben Foakes batting down the order as wicketkeeper. However, Bairstow retook the gloves in St Lucia and slotted in at No 7 as Foakes was left out - and Bayliss said that will remain the case going forward. The 56-year-old says that is "bad news" for Foakes' Ashes prospects but believes he could also challenge for a place as a specialist batsman. "The experiment of batting Jonny at No. 3 is over. And yes, that is unfortunately bad news for Foakes," added Bayliss. "Foakes is obviously a very good keeper. I think we've also discovered someone who can put pressure on that middle order from a batting point of view. "I think we've known for a while that those players at four to eight are our best, but we make no apologies to try to make it even better. That meant trying to find a number three out of those guys. "Obviously it hasn't worked for one or two reasons - four through to eight has been successful in the past and we've gone back to that."